U.S. exports of ethane have increased from almost nothing in 2013 to as much as 260,000 bpd on average in the first 10 months of 2018, according to the EIA. Ethane is a critical feedstock for petrochemical manufacturing, with plastics as the main end-use. The surge of oil and natural gas liquids production has led to a soaring supply of ethane. That has fueled a petrochemical boom along the U.S. Gulf Coast. But it has also led to a rapid increase in ethane exports. 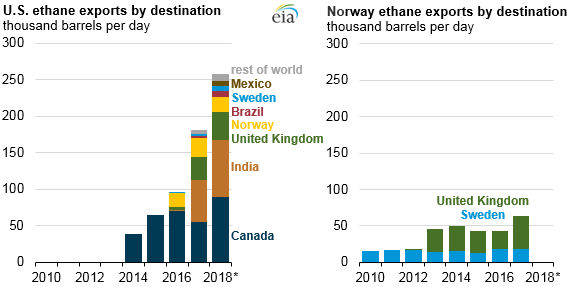 The U.S. surpassed Norway in 2015 to become the world’s top exporter of ethane (Norway is the only other country to ship ethane internationally). TransCanada’s (NYSE: TRP) Keystone pipeline remained partially shut as of Monday after a leak was discovered near St. Louis, MO. TransCanada has still not determined the cause and has not provided an estimated timeline for a restart. Range Resources (NYSE: RRC) saw its share price jump more than 5.5 percent on Monday after reporting an 18 percent increase in proved reserves at year-end 2018. BP (NYSE: BP) said that gas production started up from its second phase of the West Nile Delta development in offshore Egypt. Peak production of around 700 mcf/d is expected by April. Oil prices jumped during early trading on Tuesday on news that OPEC had sharply cut output in January. OPEC output falls by nearly 800,000 bpd in January. OPEC production declined by 797,000 bpd in January from a month earlier, averaging just 30.81 mb/d. Saudi Arabia, the UAE and Kuwait chipped in most of the reductions. Still, Russia only lowered output by 90,000 bpd, far short of the 230,000 bpd promised as part of the December deal. 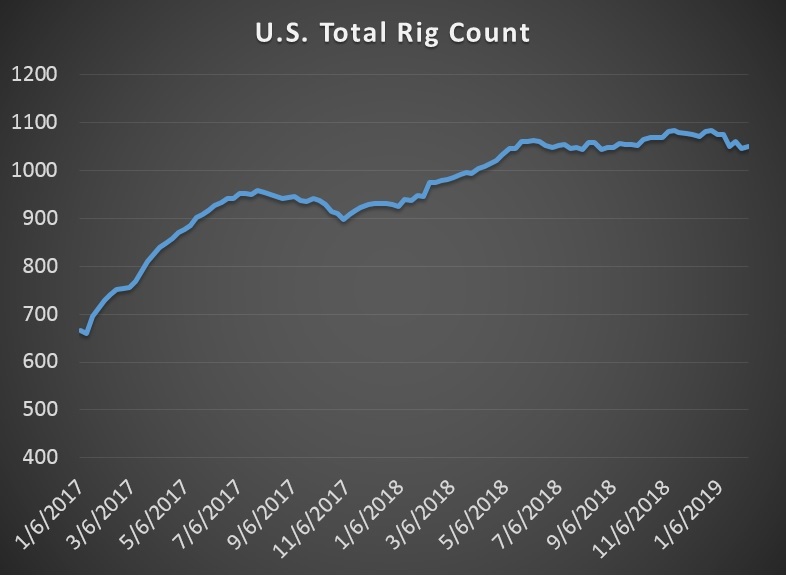 Saudi Arabia said it would continue to cut output, with plans to lower production to as low as 9.8 mb/d in March, or roughly half a million barrels per day lower than it had promised. Oil prices jumped on the news. World will be Saudi Aramco’s “playground.” Saudi Aramco will venture out into international oil and gas exploration for the first time, according to Saudi oil minister Khalid al-Falih. “We are no longer going to be inward-looking and focused only on monetising the kingdom’s resources,” al-Falih told the FT. “Going forward the world is going to be Saudi Aramco’s playground.” The plans also run against the plans of crown prince Mohammed bin Salman to diversify the Kingdom’s economy. Shale industry concerned about frac hits. A recent shale conference in Texas was dominated by discussion about how to minimize damage to shale wells from “frac hits,” which occurs when will situated close to each other interfere with production of each. This kind of well interference can reduce productivity by anywhere from 20 to 40 percent on the newer “child wells,” while also inflicting even worse damage on the original “parent well.” The industry is collecting data on how and when catastrophic losses can occur, but are only at the early stages of dealing with the problem. The reason this is important is because shale drilling will increasingly be dominated by child wells. Climate groups threaten legal action against Shell. A coalition of environmental groups are preparing legal action against Royal Dutch Shell (NYSE: RDS.A) in the Netherlands to force the company to transition off of oil. The groups say Shell is “deliberately obstructing” efforts at climate action. Trump’s tariffs kill 8,000 solar jobs. The solar industry lost 8,000 jobs last year, a second consecutive year of declines. One of the main reasons for the job losses and the slower growth was due to the Trump administration’s 30 percent tariff on imported solar panels. Nevertheless, there are around 242,000 people employed in the solar industry, more than the coal industry. Moscow shoots down OPEC+ talk. The Kremlin dismissed reports that Russia and OEPC were discussing a formal arrangement. Russia’s energy minister Alexander Novak said in December that a formal OPEC+ architecture would carry risks. Reports surfaced recently that the two sides were nearing an agreement, but the Russian government tamped down the speculation on Tuesday. U.S. crude exports to Europe increase. U.S. sanctions on Iran have opened the door for more American crude oil exports to Europe. Also, sanctions on Venezuela could result in more U.S. crude shipments abroad. Europe imported a record 630,000 bpd from the U.S. in January. Shell, Eni, Exxon win blocks in Egypt. Egypt held a tender for oil and gas exploration, and Royal Dutch Shell (NYSE: RDS.A) won the most (three for oil and two for gas). ExxonMobil (NYSE: XOM) made its debut in Egypt. BP (NYSE: BP) and Eni (NYSE: E) also won some concessions. Egypt is emerging as a key natural gas hub in the Eastern Mediterranean.